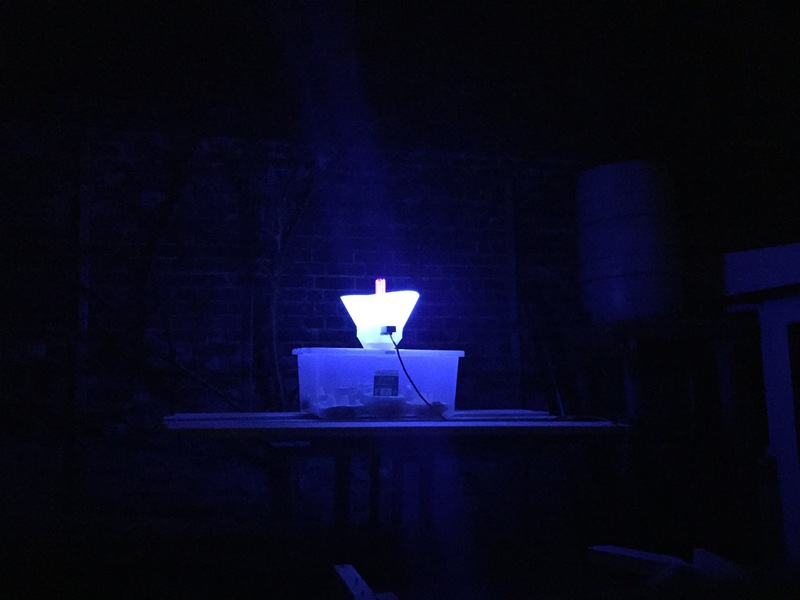 “Proper” moth traps cost around £200 including electrics, so I thought I’d try to make one with stuff that was lying around as far as possible. I reckon I probably spent a little over £20. The body of the tap is just a plastic storage box with a lid that clips on. It’s a couple of feet long and at least a foot deep. I cut a hole in the lid, roughly circular, to take the funnel. I bought a lamp holder for about £2 from B&Q. The lamp holder is screwed onto some batten that I had lying around. I drilled right through the batten and pushed the flex through. The lightbulb itself is a “black light” bulb – Leroy Koehn explains why this works to attract moths. At first, I put the batten with the light attached onto a plastic kitchen funnel which I’d hotmelted to the hole in the lid of the box. This wasn’t terribly successful – I think because the funnel wasn’t tall enough. The closest thing I could find one of those plastic collars they put on dogs necks after surgery. That now sits in and extends the original funnel to the height of the bulb. Anyway, it works! There’s no weatherproofing so I’ll probably upgrade to a skinner trap next year, and at that point I’ll firm view on how good my DIY job is.